I have had a kind of epiphany. I experimented with a new way of growing potatoes this year and it was so successful that I am converted. From now on, I will be growing potatoes like this every single season. Potatoes grow quite well for me but I have always felt a bit grudging about them. They take up so much space. They are labour-intensive: digging trenches for them; earthing them up, ideally several times; digging them out once ready. And unless you hunt down the unusual heritage varieties, they're a bit mundane. 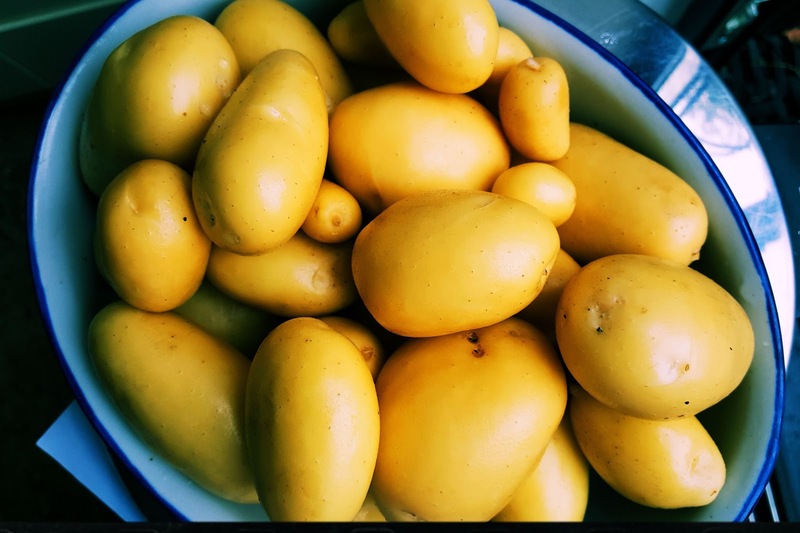 Yes, the first new potatoes, taken home and cooked as soon as possible after being dug out of the ground, taste fantastic, but by the time you're using up stored maincrops, there isn't much to choose between your homegrown and potatoes bought in the shops. The tipping point for me came last summer when for the nth year in succession I found myself digging potato plants out of the previous year's bed. No matter how thoroughly I harvest the spuds, or how many times I dig the bed over, I never find them all, and the following season, up come the plants in the middle of the beetroot, or peas, or parsnips. I've given talks in the past about growing potatoes in bin liners, mostly to people without a garden at all. Three chitted spuds in the bottom of a black-lined bag, covered with compost, will grow quite happily to give a small but healthy yield. The chances of them developing diseases or being attacked by pests is much reduced, so if you have problems with slugs, or eelworms, or conditions like scab, growing in a bin liner can give you a much greater chance of success. It's much less labour-intensive as well: chucking some multi-purpose compost over the plants to keep much of the stems covered is much less hard work than full-scale earthing up out in the field. The drawback is that confined to a bin-bag, you don't get very many spuds in your harvest. So what would happen, I wondered, if you kept to the container principle, but used one that was much, much larger? Around a cubic metre in size, in fact. Anyone who gardens regularly or who has an allotment will have a dumpy bag or two knocking around. Normally used to deliver manure, or aggregate or sand, the dumpy bag ends up in the shed, or quite often stuffed underneath it, occasionally being used to carry leaves or trimmings to the green waste bin. Would they be big enough to grow a decent crop of potatoes? 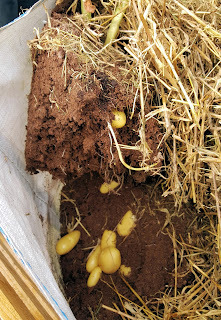 seed potatoes were planted six inches below the surface of the compost. The short answer is yes, plenty big enough. The crop wasn't just decent but impressive. The potatoes themselves were unblemished, a good size (actually the Rosevals were on the small side, but the Lady Christls, Salad Blues and Pink Fir Apples were much the same size as their open ground equivalents) and full of flavour. Each dumpy bag took nine seed potatoes at the beginning of the season and we harvested around 9-10 spuds for each seed potato once mature. Any potatoes I have missed in the bags (and it's entirely possible) will come to light when the bags are emptied and the compost inside them used to mulch and enrich other vegetable beds. Lifting Lady Christl plants to reveal the potatoes underneath. 1. Filling the dumpy bag with the requisite 0.8 cubic metres of compost. 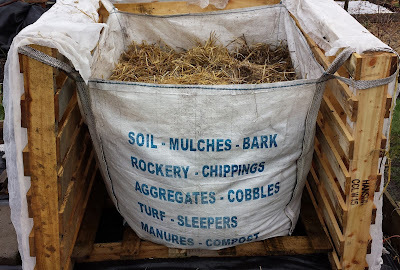 What I did was to start filling by adding lots of shredded cardboard and paper to the bottom of a bag, lots of old coffee grounds, leaf mould, free Council 'soil improver', all the usual types of organic matter, until the bag was around two-thirds full. The top third was filled with a couple of bags of multi-purpose compost; perhaps a third bag if I'd misjudged the amount of 'ballast' at the bottom. The potato plants still needed earthing up: I used lots of grass cuttings, straight from the mower, spread all around and over the haulms. 2. The potatoes grown in the dumpy bags definitely needed more water than those in the open ground. The bags themselves are water-permeable so don;' need drainage holes drilling in them, but in any dry spell, they needed copious watering, not something I'm used to with potatoes. 3. A dumpy bag, even one with plants spilling over the top, sitting on your plot or terrace is not a particularly visually appealing way to go about growing potatoes. You could, if you cared enough about this, screen with fencing, or even put them behind a low hedge. 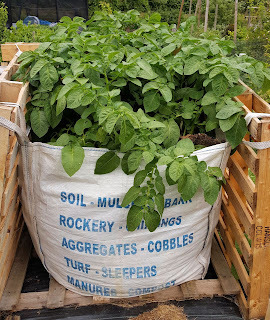 At the allotment, I used pallets stacked vertically and lashed together to frame and stabilise the bags, which did nothing for the aesthetics but did keep the bags held upright with no slumping.